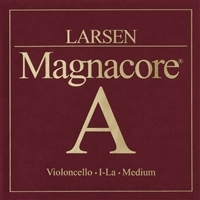 Larsen Magnacore ® The Perfected Set: Extremely well balanced set for the professional cellist offering a charismatic sound with an endless palette of colours to work with. The Magnacore ® A and D are made on a solid steel core and wound with high quality precision rolled flat wire. 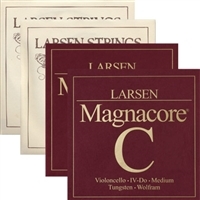 The medium tension strings are designed for a perfect fit with our Magnacore ® G and C medium strings whilst the strong combination has been developed to complement our Magnacore ® G and C strong.sistently unique Larsen sound. 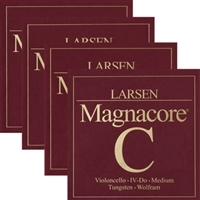 Our Larsen Magnacore ® G and C strings have an incredibly warm and focused sound. They offer a wealth of overtones, tremendous volume and exceptional string response - even when played in pianissimo. The playing-in time has been reduced to an absolute minimum, delivering outstanding string performance instantly. 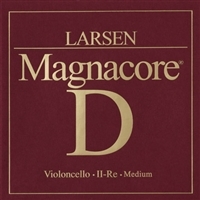 The Magnacore ® medium set offers a wonderfully sonorous and broad sound with unique ease of playability. It is ideal for cellos with a neutral to bright timbre. Compared to the medium tension set, the strong version is even more powerful, focused and direct in sound. 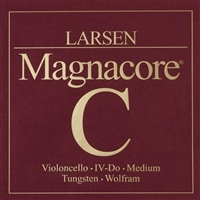 We can recommend the Magnacore strong for all celli - but in particular for the darker and deeper sounding instruments. New to the magnacore menu: The Arioso G and C with a gentle tension. Experience a new freedom of expression without a compromise in power. Well suited to both older Italian as well as modern instruments. For the gourmet musician experimenting with new combinations of sound texture and colour.